"Cecilia Noble is utterly magnetic." It's easy to love Nine Night. Natasha Gordon’s play is at once a riotous celebration of Jamaican-British culture, a warm picture of intergenerational family life and a meaningful ode to death. There’s no attempt at obscurity here, no riddles to unravel; it’s as easy as being welcomed into a home, swirling with all the intimacies and tensions of its family. And did I mention that it’s absolutely hilarious? After Gloria succumbs to cancer, her grieving family commence the Jamaican tradition of ‘nine night’. This set of consecutive evening celebrations is all about remembering the deceased, with an understanding that they are still present in the house, no longer alive but not quite yet a spirit. Gloria’s daughter Lorraine takes on the job of hosting and organising everything. As relatives and in-laws come and go and stories are swapped, her mother’s memory is weighed out between those that knew her. To whom did this woman’s love and duty really belong? And why hasn’t Lorraine dreamt about her yet? The play’s rituals are comforting and cosy: the sprinkling of rum on the ground to appease the ancestral spirits, the lighting of candles, the sharing of dreams, the hallowed photo of Gloria to which each person raises a glass. Rajha Shakiry’s set presents a shambolic, naturalistic kitchen; the working stove sends the smell of soup through the auditorium. Gordon proves she can write for big laughs. Cecilia Noble as the forthright Aunt Maggie is the funniest of them all; the audience is putty in her hands. With perfect comic characterisation and a strong Jamaican accent, she's utterly magnetic. This makes her spare moments of kindness ("sorry for your loss", she greets nephew Robert with genuine warmth) disarmingly touching. 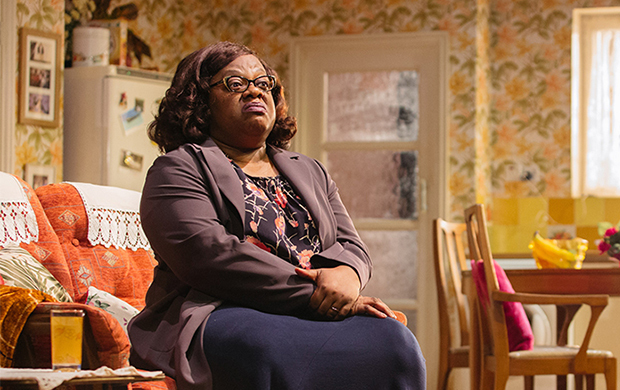 Trudy, played by Michelle Greenidge, is immediately winsome and poignantly pitiable, a neglected child who has built herself a proud and tough persona. Her bold, candid anguish clashing with Lorraine's underhand resentment could be read as a comparison of Jamaican and English cultures. Writer Gordon plays Lorraine, the character, she says, whom she felt was most herself when writing the play. She translates her onto the stage with strength and grace. Running through the play's backbone is the reality of the Windrush generation: the pressure of assimilation and the anxiety of those left behind. In the wake of the 2018 Windrush scandal, lines like, “Gloria wanted you but England didn’t”, bear a heavy weight. Nine Night’s transfer to Trafalgar Studios makes Gordon the first black British female playwright to have a play staged in the West End. That seems ridiculous, doesn't it? But thank goodness she’s here, and may her next play get the platform it deserves. This one beams out warmth and authenticity, evidence of a writer with a strong identity and lots more to tell us. 6 December 2018 - "Cecilia Noble is utterly magnetic."